BRATTLEBORO, VT—TV dance shows have boosted the interest in dance. From little kids to college students to baby boomers more and more people are interested in dance. This hype has helped draw attention to dance programs at colleges and universities across the country. Now, Brattleboro, Vermont looks to boost economic development and morale following the devastating effects of 2011’s Tropical Storm Irene with a major dance festival —The Southern Vermont Dance Festival . 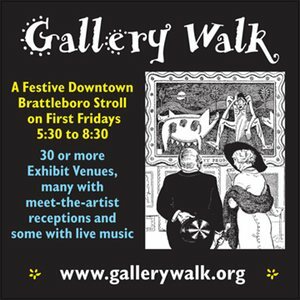 The festival is slated for July 18 to July 21, 2013 and will take place for the most part in downtown Brattleboro with time in between workshops for people shop and enjoy the town. The four-day festival will be filled with lectures, workshops, performance, live music and community events taught by world-class faculty. The president of Building a Better Brattleboro, Donna Simons, has embraced the festival under the BaBB umbrella. “Brattleboro is known as an arts community and now we can add the art of dance,” she says. The long weekend will host a wide variety of workshops that are aimed to reach all levels of dancers from the professional to the dance enthusiast. Instruction will be given by faculty such as Donlin Foreman, former Martha Graham dancer, Billbob Brown, Director of Dance at Umass, Amherst, Felice Wolfzahn, Dance Faculty from Mt. Holyoke and Bennington College, Maria Simpson, dance faculty at Bard College, Lorraine Chapman, director of LCTC (Lorraine Chapman the Company) and faculty at the Boston Conservatory and Adrian Hawkins, world renowned choreographer and dance faculty, as well as many more. Sunday July 20th. Presenting work on these three nights will be many of this generations greats, Chaos Theory Dance, LCTC Lorraine Chapman, Jennifer Weber from Decadance Theatre, Felice Wolfzahn, Jessica Howard, IBIT Dance Company and many more. Classes will be offered in Ballet, Modern, Middle Eastern, Jazz, Hip Hop, Composition, African, Yoga, Pilates and more. Ticketed festival-goers will be offered four classes per day and two evening performances throughout the weekend in addition to access to all informal performances, outdoor performances, live music and all other community events. Participants can choose to attend the festival for the full four days or sample the festival on one day only, in addition they can purchase tickets to attend the performances throughout the weekend. Classes will be filled on a first come first serve basis and can be registered for online once a ticket is purchased. 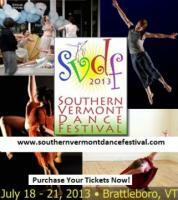 Tickets are available by visiting www.southernvermontdancefestival.com . The festival weekend will be filled with raffle events, downtown performances and workshops as well as live music and performances hosted by various local businesses. The event will be accessible to everyone who is interested in participating in a weekend of dance and movement. For more information on how to purchase tickets, sponsor the event or volunteer at the festival, please email info@southernvermontdancefestival.com.